Nothing but sunshine and fast times at this year's Fleet Feet Invitational presented by Saucony. Saturday morning teams from all over the southeast of Florida showed up bright and early to race at South Fork high school. With 39 teams and a few unattached runners, the trip to this invite was worth the drive. The first to line up and race was the girl's varsity which started at 7:45 a.m. The gun went off and after about 800 meters, Spanish River's Rylee Pustilnik and Melbourne's Natalie Bress took the lead. Pustilnik and Bress would hold those two positions throughout the entire race but in the end Pustilnik would take the win. Pustilnik, who is just a freshmen for the Sharks, won with a time of 19:06 while Bress came in second with a time of 19:18. For the overall team victory, Satellite High School came in first place with an average team time of 20:56 and scored 52. Next up to put on a show was the boy's varsity race. Just like the girl's varsity, 800 meters in a lead pack of four Satellite runners, one Forest Hill runner, and one Belen Jesuit runner started to pull away. A few runners fell off the pace and a few caught up. 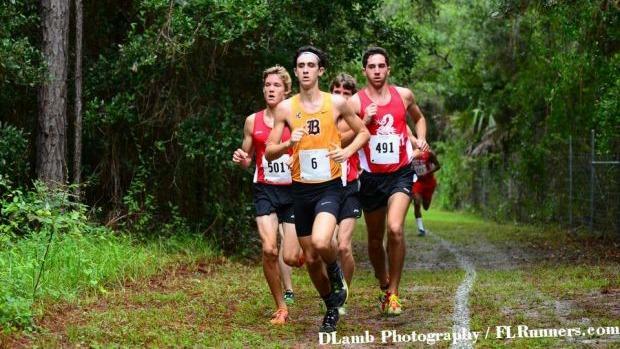 Belen Jesuit's Joshua Collins fell a few steps back from that pack about halfway in the race. But like any strong and talented runner they fight back until the end. Collins would finish strong with a time of 16:09, beating second and third place by 11 seconds. It was a close finish between Egan Kattenberg who crossed the line at 16:20:20 and John Cacciatore who crossed at 16:20:30. Satellite High School would take home another team title, winning with 29 points. To follow after the boy's varsity race was girl's JV. Lourdes Academy came in first and second with the winner being freshmen Lydia Menendez who ran a 23:04. Second was Elizabeth McCann with a time of 23:16. Lourdes Academy would also take the overall team victory. For the boy's JV race, Walker Hirsch from Satellite high school would win with a time of 18:31. Hirsch out kicked Belen Jesuit's Andres Pizzi in the end. Pizzi ended up finishing with a time of 18:38. For the overall team victory, Belen would just beat Satellite high school by 3 points.